Up to 60% off + free delivery at High Street TV! Simply use code 'CYBERDEL' at the checkout. Hurry as this code expires 27th November 2018. You can also find Cyber Monday specific banners on the network. Take the guesswork out of cooking with the CleverChef by Drew&Cole! It’s your one-stop solution for perfectly-cooked, simple, healthy meals every time. Featuring 14 pre-programmed cooking functions, CleverChef makes cooking virtually anything quick and easy. Just set it and forget it – CleverChef does all the hard work for you! The latest innovation from New Image, FITT Cube is a patent-pending, transformational fitness tool, uniquely designed for multifunctional, total-body workouts. Supporting more than 100 fun, dynamic and effective exercises, it’s s all you need to maximise every aspect of your fitness – cardio, strength, flexibility, endurance and power. The RediKettle by Drew&Cole is Redi when you are! The vacuum insulated, double wall, Heat Lock Technology keeps your water drink-ready hot for up to four hours with no keep warm function! RediKettle doesn't use any extra energy to stay hot for four hours! Iron, Steam and Refresh the new way with the best-selling Verti Steam Pro, brought to you by Drew&Cole. It’s the 3-in-1 complete Vertical Ironing system that could save you so much time! The 10-in-1 Maxi-Glider 360 is the new, uniquely designed fitness and weight loss system that works your body from every angle. Like a traditional elliptical machine, Maxi-Glider allows you to move both forwards and backwards. 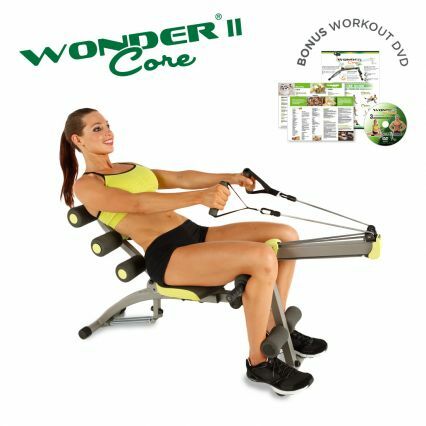 Unlike some ab machines and floor exercises that work through a limited range of motion, Wonder Core 2 goes beyond 180° with an extended range of motion to target your entire core. But Wonder Core 2 is more than just an ab workout – with its built-in upper body station attachment it’s a 12-in-1, muscle-toning system designed to give you the total body results you want without the gym. 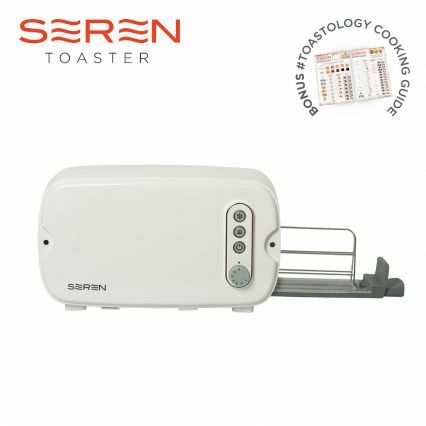 The multi-purpose Seren Toaster is hugely versatile. The variable-width, side-loading rack is suitable for the types of bread you can’t toast in your current toaster; ciabatta, paninis, baguettes and naans can all be toasted in your Seren Toaster! 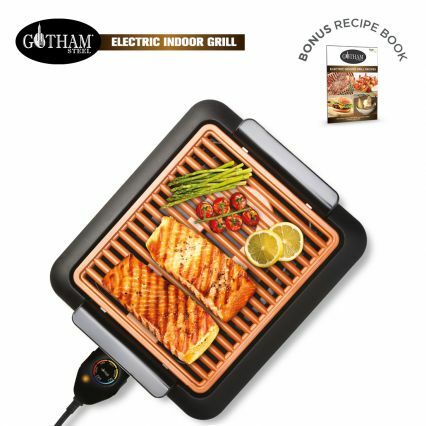 The Gotham Steel Smoke-less Indoor Grill is the ingenious new way to get barbecue-style results indoors with virtually no smoke! Thanks to the non-stick heated grill plate, all the fat and oil simply drains away into the stay-cool drip tray, where it’s virtually impossible for smoke to form. Now you can enjoy all your favourite grilled foods all year round! The NutriBullet is the phenomenally popular Nutrition Extractor loved by millions around the UK! 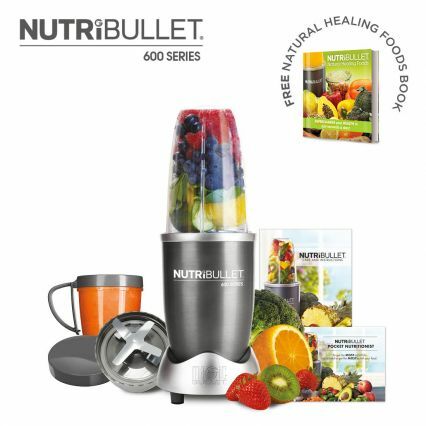 NutriBullet’s powerful 600W motor and cyclonic technology creates delicious NutriBlasts by breaking down fruits, vegetables, nuts and even ice through the turbo Extractor Blade. It pulverises stems, seeds and skins where some of the usually neglected essential nutrition lies, providing a fast and easy way to contribute to your Five-a-Day! 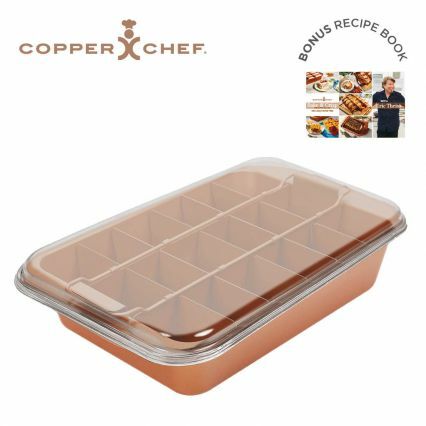 With the new Copper Chef Bake & Crisp, you can cook delicious, perfectly portioned meals all in one baking dish. Featuring ingenious adjustable slicing dividers, you can make individual portions of lasagne or shepherd’s pie, or pre-sliced brownies and cake with ease.